The cheque is simply, an instrument, which contains an order to the bank to pay the specified sum from the drawer’s account to the holder of the instrument. On the other hand, demand draft is a financial instrument that is payable on demand. Banks are integral part of our life as millions of transactions take place every next minute, in which the bank is involved in some way or the other, such as depositing cash and valuables, withdrawing cash at any time, transferring money from one place to another, payment of bills, booking of tickets, purchase, and sale of products or services etc. These activities can be performed by ATM, net banking, cheques and demand drafts and so on. But what do the two terms cheque and demand draft means? What is the difference between them? Come let’s understand the difference between a cheque and demand draft. The cheque is a negotiable instrument containing an order to make a certain amount of payment to the payee and is signed by the drawer. It can be easily transferred through a mere hand delivery. There are three parties to the cheque- Drawer (maker of the cheque), Drawee (bank on which the cheque is drawn), Payee (to whom the amount of the cheque is payable). Bearer Cheque: The cheque in which the payment is made to any person who presents the cheque to the bank. Order Cheque: The cheque in which the payment is made only to the person whose name is specified in the cheque. Crossed Cheque: Crossed cheque means that the two transverse parallel lines are made on the face of the cheque, to give a better title to the holder of the cheque. Such a type of cheque can only be transferred to the payee’s account. Uncrossed Cheque: The uncrossed cheque is a kind of cheque which is made payable at the time of presenting it. Stale Cheque: The type of cheque, which is presented after the specified time of three months is a stale cheque. Demand draft is a negotiable instrument issued by a certain bank that directs the other bank or one of its own branches to pay a certain sum of money to the payee. 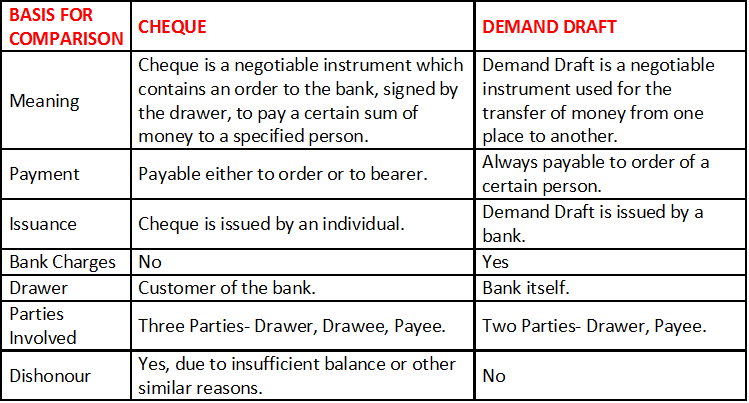 In the case of demand draft there are two parties involved in it, one is drawer (bank or any financial institution), and the other is payee (to whom the amount is transferred). It is used for transferring money from one place to another and it cannot be transferred by a mere hand delivery. Sight Demand Draft: The type of demand drafts in which the payment is made only after the presentment of the specific documents at sight. Time Demand Draft: The type of demand draft in which the payment is made only after the specified period. 1. Cheque is payable either to order or bearer whereas Demand Draft is always payable to the order of a certain person. 2. Cheques can be dishonored due to insufficient balance, whereas dishonor is not possible in case of Demand Draft due to pre-payment of the amount. 3. Cheques are issued by the customers of the bank while the bank itself issues the Demand Draft. 4. Cheque book facility is available only to the account holders of the bank, but Demand Draft facility is available to both the account holders and non-account holders. 5. The purpose of the cheque is to make payment in a safe and easy mode while the purpose of the demand draft is to transfer money from one place to another. As we have seen from the above discussion, both of these negotiable instruments are significant in its own way. To deal with millions of transactions on a daily basis, one can avail the benefits of a cheque, which is easy and convenient to use and in case the amount needs to be transferred from one place to the another; demand draft is the best option to go for.